Bioreactors are devices used to address the manufacturing needs of cell therapy developers culturing cells in the large numbers needed to treat disease. Stirred tank bioreactors (STRs) not only provide developers with the ability to alter environmental conditions such as pH or oxygen, but also contain an impeller which agitates the fluid environment to promote cell expansion. In order to optimise a manufacturing process, the industrialisation team at Cell and Gene Therapy Catapult (CGT Catapult) compared repeated cultures to gain a statistical understanding of how cells grow in particular conditions. These physical cultures can become expensive, so the ability to model these cultures computationally offers a powerful cost-saving development tool. CGT Catapult worked with Sartorius Stedim Biotech (Royston UK) in order to evaluate the application of their new ambr® 250 modular bioreactor system for the industrial scaling of cell therapy manufacturing processes and to identify opportunities for further optimization. The CGT Catapult team used in silico computational fluid dynamic (CFD) modelling to analyse the fluid within the bioreactor during cell culture. This allowed them to understand the fluid pressures and stresses upon the cells and predict the effect of modifications such as speed or geometries of impeller and vessel on cell growth. 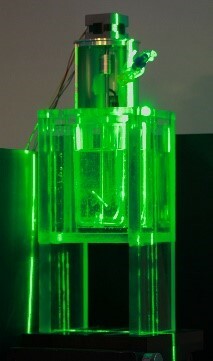 To validate the model the team built a clear plastic replica of the STR, which allowed them to see inside the bioreactor. In partnership with Dantec Dynamics, a technique called Particle Image Velocimetry (PIV) was used to observe particle motion inside the bioreactor and generate a complete map of fluid velocities. This was then compared to the CFD model to validate its ability as a predictive design tool. During PIV the STR replica was filled with highly-reflective microscopic particles, and a thin laser sheet shone through the fluid. High speed digital photography then allowed the team to observe the particles movements. The output of this project was a validated computer model of the internal environment of Sartorius’ ambr bioreactor system. This model was used to advise on operational and geometric changes to improve the bioreactors functionality with cell therapy processes, and can also be used to speed up and reduce the costs of process development. In developing our capability in computer modelling of fluids, we are now able to support other companies in developing and refining their technologies.